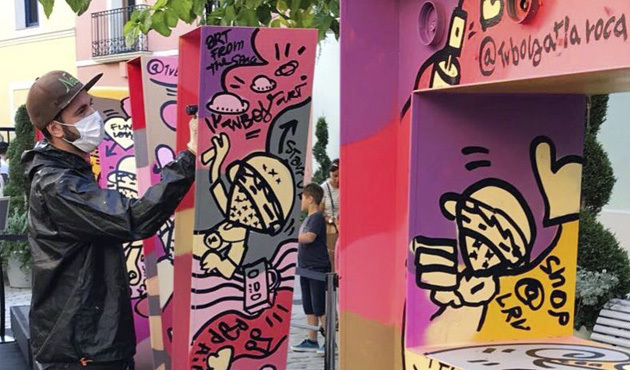 Urban Pop Art has landed at La Roca Village thanks to TV Boy, an urban artist that started his career painting on the streets of Milan. In 2004 he moved to Barcelona, where he started to turn heads and gain international acclaim and has now exhibited in galleries and museums in various countries. With his spray paints in hand, TV BOY has customised the words HAPPY, JOY, LOVE in full graffiti style with touches of abstract expressionism and American. Colour effects, intensity and volume. Urban pop art, with hints of fashion, travel and trends. A nod to optimism as part of an original piece exclusively created for La Roca Village, which will add to a long list of exhibitions and projects by this truly unique urban artist. 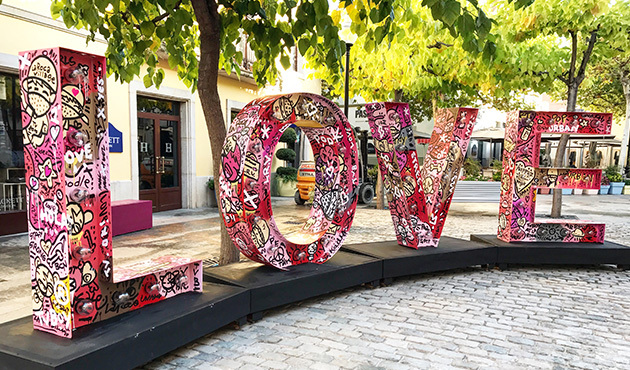 On 7 and 8 October 2017 the artist TV BOY painted the word LOVE at La Roca Village. Visit us, enjoy this work of art and share it! #TVBoyatLaRocaVillage #LaRocaVillage and #MakeitYours. After brightening up the Village with his expressive pop art, famous urban artist TV BOY wanted more. On 21 and 22 October 2017, this unique artist personalised clothes and accessories purchased by guests at La Roca Village. In addition, he gave away dedications and urban pop art fabric bags that he had customised. *TV Boy was one of the participants in the 4th Edition of Barcelona Designers Collective.